(Okayama, 06 March) In a study recently published in the European Journal of Pharmacology researchers at Okayama University show how the presence of inflammation in the brain can increase its sensitivity to benzodiazepines. Benzodiazepines (BZDs) are drugs commonly prescribed for anxiety, insomnia and seizures. However, in post-surgical patients taking BZDs, undue side-effects such as excessive sleepiness, weakness and delirium have often been observed. Associate Professor Yoshihisa Kitamura and and Professor Toshiaki Sendo from Okayama University and colleagues have recently shown that inflammation, which is a normal after-effect of surgery, might be potentiating the effects of these drugs. BZDs act by activating a receptor in the brain known as the GABAA receptor (GABAR). Typically, GABAR is activated by chemicals inherently present in the brain. However, because drugs like BZDs can mimic these chemicals, they are used to stimulate the activity of GABAR in the lab. When GABAR is excessively activated, animals tend to exhibit inhibitory effects, such as loss of consciousness and loss of normal reflexes. One such reflex observed in animals is the righting reflex, that is, their tendency to immediately prop back up on their paws, when made to lay supine. This suggests that the animal is awake and alert. For their study, the investigators first artificially stimulated GABAR in the brains of mice, using a sedative called pentobarbital. As expected, pentobarbital induced a loss of the righting reflex (LORR). Under normal conditions, BZDs should prolong the duration of the LORR, as they activate GABAR even further. This was observed with a high, but not low, dose of the BZD, diazepam. Another group of mice was then treated with a bacterial endotoxin that triggered inflammation in their brains. When this group was given diazepam, it prolonged the duration of LORR even at a low dose, suggesting a sensitivity to diazepam in the inflammation-induced mice. To address if these effects were specific to GABAR, a drug that inactivates these receptors was subsequently used. The duration of LORR in these mice was considerably reduced, confirming the role of GABAR. Interestingly, even when the mice were given a drug that reduces inflammation, the duration of LORR was reduced. Inflammation was indeed the culprit. The prolongation of reflex loss seen in mice given diazepam was thus linked directly to GABAR and inflammation in the brain. 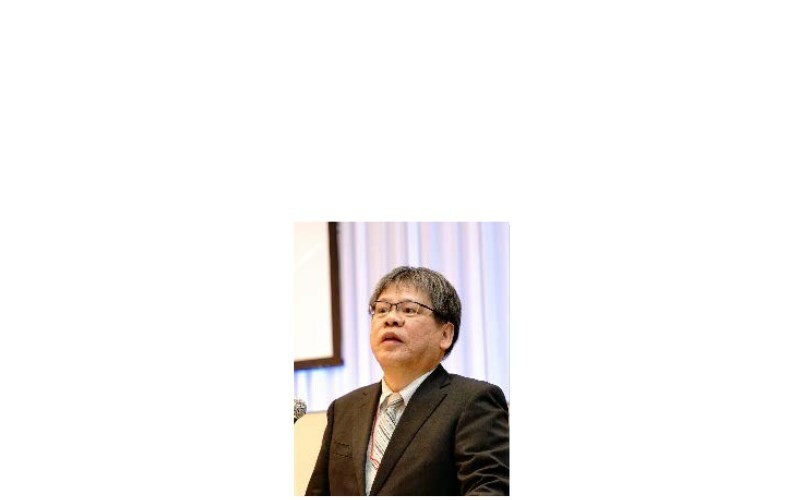 Associate Professor Yoshihisa Kitamura and and Professor Toshiaki Sendo from Okayama University and colleagues speculate that inflammation might result in an increase in the number of GABAR in the brain, which makes the inhibitory effects of diazepam more profound. “Thus, inhibition of inflammation in the brain may be a promising strategy to prevent the effects of benzodiazepines, such as weakness, over-sedation, and delirium, experienced in patients after surgery”, concludes his team. Prescribing anti-inflammatory drugs to these patients could, perhaps, be one such strategy. Inflammation is a condition in which the body’s surveillance system secretes chemicals to the protect it from pathogens such as viruses and bacteria. The condition manifests as redness, swelling, and pain. In the case of neuroinflammation, microglia, the watchdogs of our brain are activated. Neuroinflammation is often associated with traumatic brain injury, neurodegenerative diseases and aging. BZDs and GABA: Gamma amino-butyric acid, or GABA, is a signalling chemical in the brain known as a neurotransmitter. GABA attaches to its receptor (GABAR) on the brain cells and induces inhibitory effects i.e., it decreases brain activity by calming it down. It has been stipulated that alcohol induces its effects by docking onto GABAR. Drugs that are similar in nature to GABA, and thereby activate its receptor, such as diazepam and pentobarbital are used in conditions such as anxiety, epilepsy and for anaesthesia. These are all conditions where brain activity needs to be subdued. Yoshihisa Kitamura, Shiho Hongo, Yoshiaki Yamashita, Shinpei Yagi, Kanami Otsuki, Akihisa Miki, Ayumi Okada, Soichiro Ushio, Satoru Esumi, Toshiaki Sendo. Influence of lipopolysaccharide on diazepam-modified loss of righting reflex duration by pentobarbital treatment in mice. European Journal of Pharmacology, 2019 Jan 5;842:231-238. 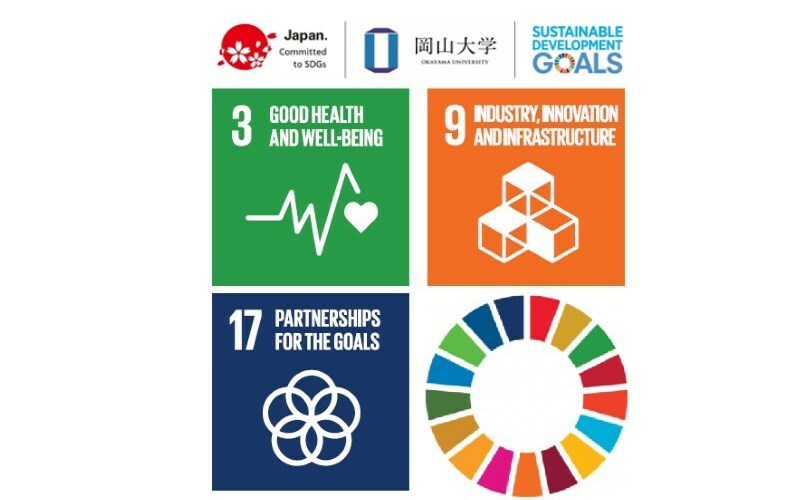 Associate Professor Yoshihisa Kitamura, Ph.D. The bacterial toxin (LPS) activates microglia in the brain (observed by a brighter green signal), suggesting that inflammation was set in motion (left). Under normal conditions, only the highest dose of diazepam (1 mg/kg) increased the sleep time in mice (right top). 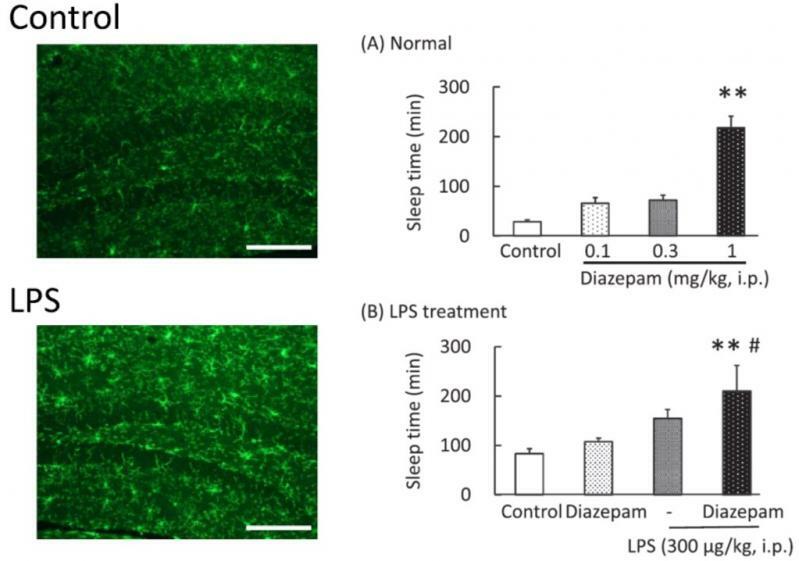 However, once LPS triggered inflammation, even a low dose of diazepam (0.3 mg/kg) increased sleep time (right bottom).